For many years, people lived their lives within clear, defined frameworks that shaped their identities. The individual knew full well the make-up of his or her family structure, occupation and socio-economic standing, as well as his religious obligations (which were, of course, unchanging). In this reality, where the promises of social mobility were so limited, people simply asked fewer questions and took less responsibility. In many respects, life was simpler. Our situation today is different. With technological changes – the development of the internet, the breakdown of virtual and physical borders and the spread of globalization – people’s ability to self-define and self-identify has become more complex in every regard. Traditional and clear definitions have collapsed and no longer stand. In terms of personal identity, chaos reigns. The solution that many people have found for this difficulty is the choice to define identities by their negatives: “What am I, and what am I against?” This approach does create renewed identity borders for the individual, however these are often divisive and harmful. Whereas in the past, an individual was a part of something, this is no longer the case. Instead of identifying positively, today we do so by standing in opposition. The result is a deep split in the structure of the family, the people and the nation. It’s important to remember that for the majority of humanity, that most basic and strongest form of self-identification – that which doesn’t change based on outside influences – is the question of national identity, or belonging to a people. For me, personally, this is entirely real. I was born and raised in the Soviet Union, which for seventy years sought to erase national and cultural identities, and to prevent its citizens from recognizing and acting on their individual heritage, language and faith. Rather, the goal was to create a new, uniform “Soviet” identity, whose adherents would cease to see themselves as individuals, and thus wouldn’t push to shape their own fate. As soon as the Soviet Union fell, its constituent nations re-formed as independent states, fulfilling the heritage of their people and speaking their language. I felt, and feel, a part of this. Being a part of the Jewish people defines my identity, strengthens and empowers me, granting me the opportunity to move forward in life. Modern discourse around liberalism centers around equality, and neglects the matter of our roots and origins. But true liberalism, in fact, comes only from individuals whose identities are fully-formed. Only someone who feels complete and content with the most basic sense of where he belongs, can fully accept another person, unintimated by what the ‘other’ might do to his sense of self. It’s worth remembering this as we re-assess our starting point. Liberalism isn’t just a pretty word meaning ‘love for all mankind,’ because it’s impossible to truly love the other without first loving oneself. And to truly love oneself, it helps to know well who and what we really are. 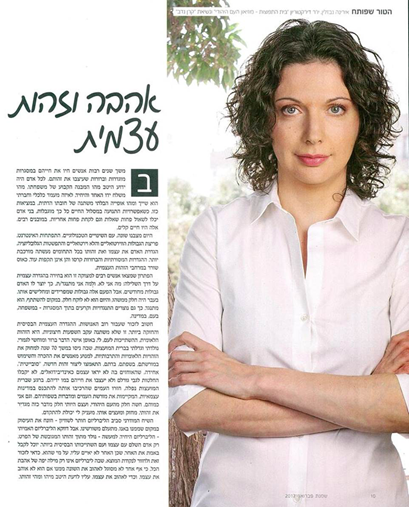 Irina Nevzlin is the Chair of the Board of Directors of the Museum of the Jewish People at Beit Hatfutsot and a Partner and Member of the General Meeting of JPPI on behalf of the Nadav Foundation.